Each year, our association of churches hosts a day of youth competition called “Youth in Action”. The competition includes individual events such as preaching, children’s Bible stories, evangelism techniques, dramas, and music. The event that takes the most training and coordination is the Bible quizzing event that is the culmination of the day. Our youth group has always focused our energies on this event. The teens are given 100 questions to memorize with the corresponding answers. The topics range from doctrine to practical Christian living. One section of questions this year focused on the topic of defending the faith and answering other religions. As the her daughter repeated the verses Lucas 1:47 and 1 Timothy 2:5 over and over again, Anita finally stopped her daughter and said, “This all makes sense! These dead saints can’t do anything to help me! They were just humans beings like I am. Why should I pray to them? From now on, I am only to going to pray to God!” That same day, Anita took down all of her images of the Virgin Mary and removed her statues of various Catholic Saints. We know that Anita is not far from received the only Mediator between God and man, the man Christ Jesus. Please be praying for her and for many others here in Ecuador who are lost in their religious traditions. They are so familiar with the characters of the Gospel, but so far from understanding the salvation offered to them as a free gift through faith. Our quiz team went on to win first place in the tournament for the second year in a row. They faced down 10 different churches, many of which are three of four times their size. However, the real victory had already been won. It was a spiritual victory that we pray will be repeated in many homes throughout Cayambe. 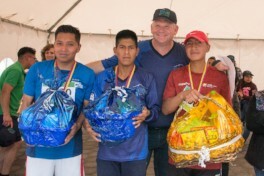 On Sunday, our church sponsored the 2nd annual 5K race in Primero de Mayo. We started early in the morning setting up the pavilion, tracing out the course, preparing the prizes and setting up the sound. We really challenged our church family that this annual event is one of the best opportunities we have to show our testimony to the community that surrounds us. As a result, we had almost the whole congregation helping. We distributed more than 200 Gospel tracts and brochures. There were more than 60 kids who ran the 1K children’s race as the adults warmed up for their 5K. We had about 40 adults participate in the race and we gave prizes in the form of medals and gift baskets. It was a terrific turn out. Now we pray for good opportunities for follow-up opportunities to share the gospel with those who attended. 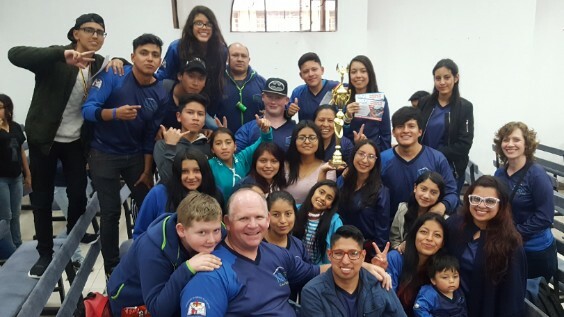 Praise for our youth who recently earned first place in Bible Quizzing in the Youth in Action competition held by our association of churches. They bet out 10 other teams to take the trophy for the second year in a row. Praise for an excellent outreach opportunity on Sunday as our church sponsored the 2nd annual 5K run as part of the festivals of our community. Pray that this event would bring people into our fellowship and provide follow-up opportunities to share the Gospel. Praise for the progress we are seeing in the work Brenda is doing with the single mothers in our ministry. She is doing a weekly Bible study with three girls in addition to her weekly ladies Bible studies every Wednesday. Praise for the good testimony of our youth and the outreach they have to their own unsaved families. Pray for the salvation of the parents of many of our teens. Pray for two unsaved families who have been attending our church off and on for the last several months. Pray for more opportunities to share the Gospel and for their willingness to accept Christ. Pray for Daniel and Luke as they are finishing up the school year this month. Pray that they would finish their studies well. Pray for the many preparations that are already under way for the summer VBS, camps, and teams.